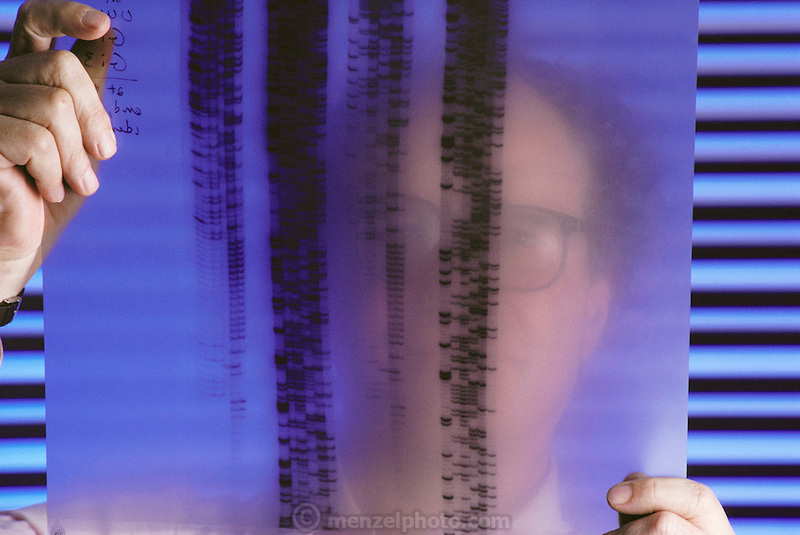 Harvard scientist Walter Gilbert studying a DNA sequencing autoradiogram, made in the course of research associated with the human genome project. The term genome describes the full set of genes expressed by an organism's chromosomes. A gene is a section of DNA that instructs a cell to make a specific protein. The task of constructing such a complete blueprint of genetic information for humans is divided into two main phases: mapping genes and other markers on chromosomes, and decoding the DNA sequences of genes on all the chromosomes. Numerous laboratories worldwide are engaged on various aspects of genome research. MODEL RELEASED.